Cookbooks are my favorite read. There is no doubt about it. I have been cooking for a long time. I have also loved to cook. Even when my husband and I were teenagers our idea of fun was having a dinner party with friends and teachers. We even paired wines with the food! Then when we were a young married couple we had "guinea pig" dinners where we would try new recipes out that neither of us had ever prepared before. Good news is we never killed anyone or caused serious harm. Then there were the years of preparing meals for my family while working full time and being a volunteer leader in my community. I looked for ways to prepare "complete" meals that didn't take too long, weren't too complicated and my kids would eat. All my cooking was done because it looked good, was known to taste good, was recommended by someone or was a favorite of the kids. I wanted to offer a great meal that was "complete" but I never thought about it being a "balanced" meal or a meal with the healthiest of ingredients. The only thing I did pay attention to was calories but that was only when I was watching my weight. 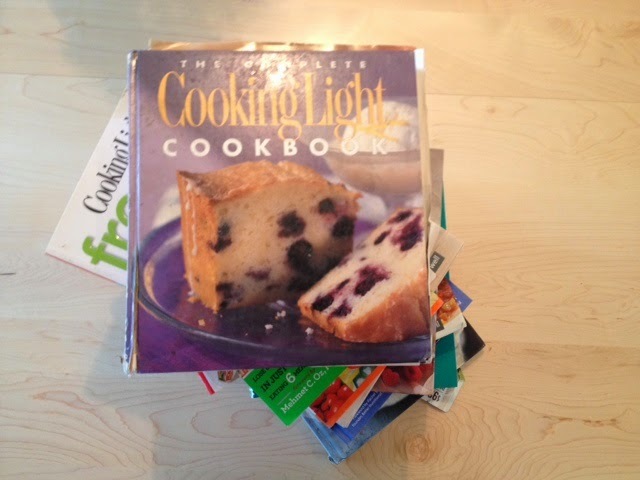 As you can see, I love cookbooks! I learn so much from each one. It also keeps me from getting bored with the "same ol' same ol'". You might have also noticed that Cooking Light is very present in all categories. I find their books so well done and the recipes are well concieved. They are always visually attractive, the right amount of calories and incredibly tasty-- what I require in any recipe and meal I prepare. And, of course, you can find so many terrific recipes on line through their site or myrecipes.com. We are so fortunate to live in an era that has an abundance of resources for us to plan and cook healthy meals. The challenge is taking the time to be organized and to make the meals! The results, however, are totally worth it.